If you have been looking to avoid spoilers for the new Avengers film out in less than a month, and successfully managed to avoid the new look yesterday then you probably want to also scratch off the Toy section on your list of safe spaces with the new Avengers End Game sets officially launching. Sneak peeks were available last week but all the new sets were made available for purchase from today on LEGO.com in addition to appearing in stores. If you are a fan of LEGO you probably already know when it comes to Marvel LEGO keep secrets just as well as Tom Holland. With examples like spoiling Giant Man in Civil War LEGO isn’t exactly at the top of our list of people we would trust with the location of the Soul Stone. If you want to go into End Game with a clean slate it might be best to stop at this point. Starting off with the least spoiler’y set is the Captain America Outrider Attack. Also, the cheapest of the sets coming in at $39.99 AUD the set includes Captain America of course along with some Chitari minions similar to the previous Avenger sets we have seen. Moving up in Price and definitely in spoiler rating is the new War Machine set. 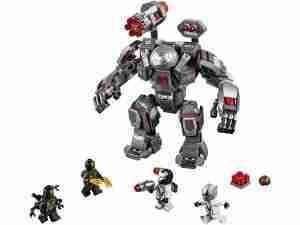 Following the Hulk Buster path, Rhodey also has an upgrade with a suit similar to the Hulk Buster LEGO sets released previously with a normal sized War Machine minifig included in the set that can be put inside the larger armour. The War Machine or possibly Thanos Buster amour stands 17cm tall with the full set only containing 362 pieces (much less than the previous Age of Ultron Hulk Buster set but on par with the Infinity War Hulkbuster Armour) but also includes a much lower price at only $49.99 AUD. Next up in price is what we think is the coolest set with the Hall of Armours. 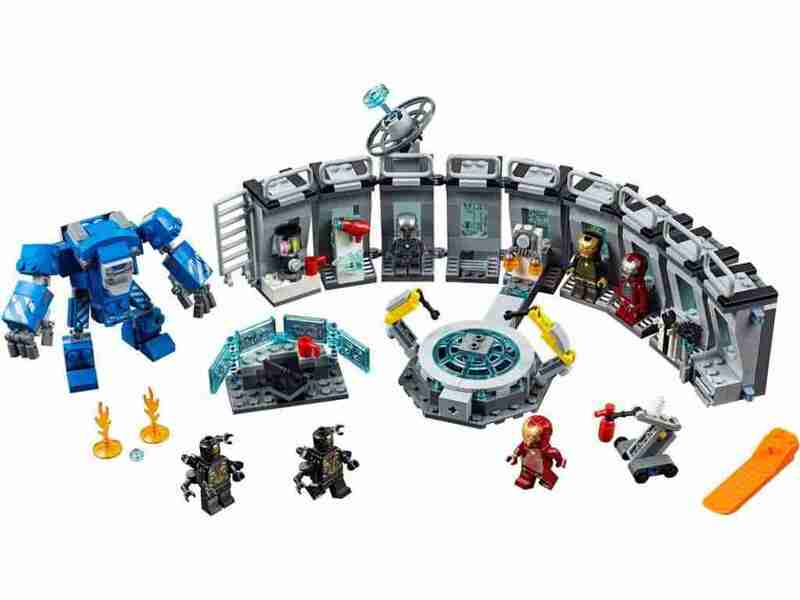 Looking like it belongs in Iron Man 3 with multiple armours included in the set including a very cool Mk 1 minifig, we could very easily see us purchasing multiples of this set to stack and collect every Iron Man minifig in it. Not the largest set physically the price tag sits at $89.99 AUD and includes some minions to battle but you can’t look past the inclusion of ‘Dummy’ from the Iron Man films holding a fire extinguisher if you need to re-enact all the MCU films during your rewatch this month. 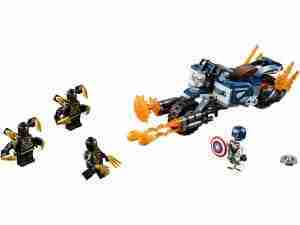 Moving onto one of the larger sets with Thor being the focus (to go with the Captain America and Iron Man themed sets) is the Quinjet set. 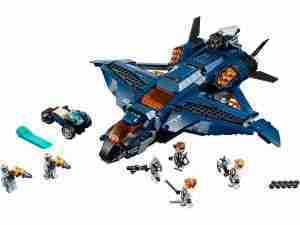 Not the first Quinjet LEGO but definitely the biggest with several cool features including the retractable turret on the back and space inside to hold multiple Minifigures at once. Possibly a little too large to land on your LEGO Helicarrier, the set does include Thor complete with Stormbreaker, Hawkeye and Black Widow for the price of $139.99 AUD in an 838 piece set that measures 40cm long and 28cm wide. 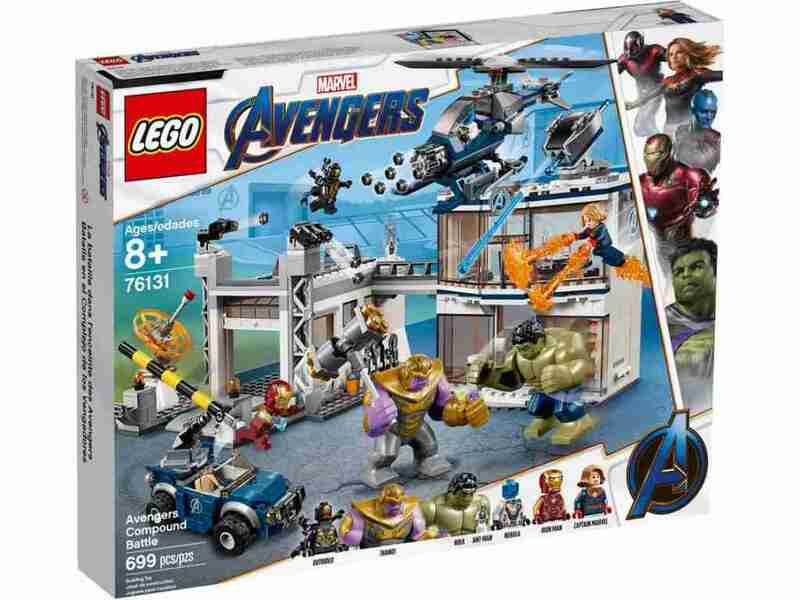 And lastly we have probably the biggest set and biggest spoiler set of all, the Avengers Compound Battle. Retailing for $169.99 this is the End Game equivalent of the Sanctum Showdown set from Infinity War except with a TON of spoilers (if it is actually part of the film and not a red herring). With 699 pieces this set may not have as much in the way of building like the Sanctum but it does include multiple unique Minifigs. Not only do we get Thanos but a slightly different coloured (more grey) Hulk which may be a reference to comic-based changes for Banner in the new film, but we also get a microfig Ant-Man which is extremely cool in itself and unique to this set. With the new ‘special look‘ trailer drop yesterday showing Iron Man/Thor/Captain America approaching Thanos surrounded by what looks to be earth-like building rubble it would not be a stretch to assume the Compound Battle is part of that but with End Game being 3 hours long in run time and these sets possibly be related to the same section of the film we are hoping there are a lot more surprises in store on April 24th. 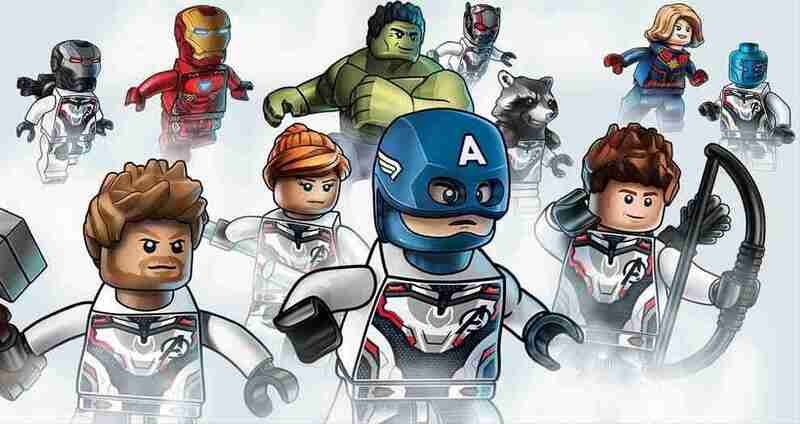 If you are after any of the sets you can order them online from the LEGO online store but if you want to check them out in person they will be appearing in most stores with being in the official LEGO stores in Sydney and on the Gold Coast all but guaranteed.